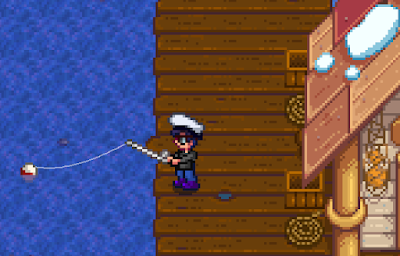 Willy’s fishing supplies are completely dependent on your Fishing Skill, and at first he’ll only have two items for purchase. As you continue to fish and improve your Skill he’ll reveal new stock, and when he brings in new Rods (Fiberglass and Iridium) he’ll send you alerts in the mail. In addition to his stock, Willy will purchase any fish and fish-related foraged items (basically anything you can pick up off the beach). This makes fishing on the dock outside his Shop highly desirable, as you can fill up, sell your fish within seconds, and go back to work with a cleared backpack.